HONG KONG, Nov 7, 2018 - (ACN Newswire) - Organised by the Hong Kong Trade Development Council (HKTDC) and co-organised by the Hong Kong Optical Manufacturers Association (HKOMA), the 26th edition of the Hong Kong Optical Fair opened today and runs until 9 Nov at the Hong Kong Convention and Exhibition Centre (HKCEC). This year's fair welcomes a record 810 exhibitors from 23 countries and regions to showcase the latest design trends and eyewear products, providing a one-stop marketing and sourcing platform for the industry. As awareness of eye health grows and optical products are regarded as fashion accessories, there is huge growth potential for the eyewear market, with the industry among the fastest-growing sectors. "As a major production centre and exporter in the global optical industry, Hong Kong has an important position in the global eyewear market. 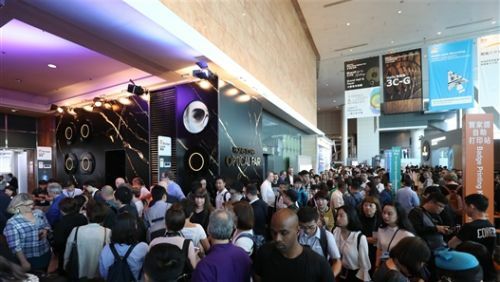 Being a leading industry event in Asia, the Hong Kong Optical Fair is expanding its scale this year, launching the new IT Solutions and Shop Fittings zone to showcase the latest applied technologies and products to help the industry raise production and business efficiency," HKTDC Deputy Executive Director Benjamin Chau said. "To help the local industry enter the international market and capture the enormous opportunities in emerging markets, the HKTDC has organised 78 buying missions from 48 countries and regions, bringing more than 5,400 buyers to the fair," Mr Chau added. Among the major importers, distributors and retailers visiting the fair are eyewear retailer Asteroptica S.R.L. from Argentina, online eyewear retailer NV ACESSORIOS E OCULOS LTDA from Brazil, retailer Glass Story from Korea, optometric centre Oftaconsult S.R.L from Romania, Shanghai Tangchao Glasses Co., Ltd and department store El Corte Ingles (Shanghai) from the Chinese mainland, as well as start-up Stellio Ventures SL from Spain. Debuting at this year's Optical Fair, the IT Solutions and Shop Fittings zone features exhibitors from Argentina, Hong Kong and the United States. Novar Technologies (Booth: 1E-A42), joining the fair for the first time, brings a cutting-edge eye examination apparatus that can effectively increase the accuracy of pupil measurement. Local company 3DNA Eyewear (Booth: 1E-A40) showcases its self-developed interactive eyewear customisation platform that can scan and measure customers' facial features through computer software and then produce customised frames using a 3D printer. Another Hong Kong company, Mastermind Manufacture Limited (Booth: 1E-A32), demonstrates how their shop design and installation solutions can help retailers enhance their brand image and develop effective marketing strategies. - Naturalism.T from Taiwan (Booth: GH-F12) presents their bamboo-made eyewear collection, which won the 2015 Red Dot Design Award. The craftsman stacked bamboo chips ingeniously to make a super-thin and light frame that is only 2.3mm thick with a unique texture. 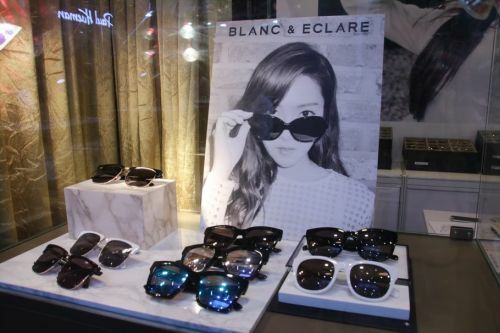 - BLANC & ECLARE (Booth: GH-D02), the brand established by Korean superstar Jessica, brings the latest HAVANA collection that accentuates a vintage style with a large round frame. - High-end eyewear brand LIE EYEWEAR (Booth: GH-F03), launched by high-profile Korean designer Lie Sang Bong, showcases a pair of classic minimalistic sunglasses made with beta-titanium and featuring gradient lenses. - Eyewear brand ITUM (Booth: GH-F41), created by young Hong Kong entrepreneurs, displays the MONO collection of 3D-printed customised nylon eyewear that fits the user's face perfectly, making it much more comfortable to wear. Customers can even change their lenses to match their outfits. - Several brands showcase their latest eyewear designs related to popular films, including local brand BIG HORN (Booth: GH-E12), which has launched sunglasses in a visionary crossover with the Justice League. Savile Row (Booth: GH-R07) from the United Kingdom shows its Warwick model, as worn by Daniel Radcliffe in the world-famous Harry Potter films, and Italian brand HEX (Booth: GH-G09) presents its iconic hexagonal glasses inspired by The Fifth Element. In response to growth in the contact lenses market, the Contact Lenses & Accessories zone is conveniently located at the Level 2 Mezzanine to meet buyers' sourcing needs. 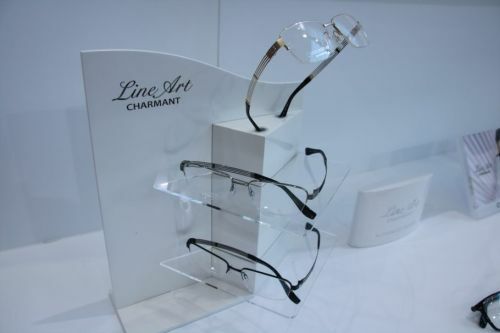 Other thematic zones include Sporting & Professional Eyewear, Kids Eyewear & Reading Glasses, Frames, Lenses & Parts, Eyewear Accessories, Diagnostic Instruments, as well as Optometric Instruments & Machinery. There are also group pavilions from the Chinese mainland, France, Italy, Japan, Korea and Taiwan, along with the HKOMA and Visionaries of Style pavilions, providing a comprehensive trading platform for the industry. Capable of capturing the ever-changing market trends, Hong Kong eyewear companies are keen to launch original brand designs to expand into the global market. To support them, the Hong Kong Eyewear Designer Club has set up a display area at the Brand Name Gallery to promote collections from Hong Kong designers, such as BIG HORN, Genic Eyewear and P+US. The 16th Hong Kong Optometric Conference will be held tomorrow (8 Nov) with the theme "The Contemporary Role of Optometrists in Primary Care". Optometry experts from the United States, Canada, Hong Kong and the Chinese mainland, including Professor Zhuo-Hua Pan from Wayne State University, Professor Robert Hess from McGill University and Professor Benny Zee from The Chinese University of Hong Kong, will examine some of the biggest optometry issues including gene therapy for vision restoration, treatment of amblyopia in adulthood and artificial intelligence (AI) computing for health-risk prediction. A number of other seminars are organised to discuss various industry issues, including the development of contact lenses in Asia and Euro-American market trends, providing the industry with global market information. The Hong Kong Optical Fair runs concurrently with the HKTDC Hong Kong International Wine and Spirits Fair (8-10 Nov), drawing cross-sector buyers for additional business opportunities.